If you have a blog or a website on your web host server, you know how important the FTP client can be. So an FTP program is a must have. But, if you didn’t know you can also access your ftp account right from windows explorer window, just like you access folders and files in your windows explorer. 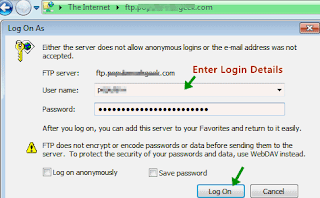 Step 1 : Type in the ftp host name of your webserver. (ftp.example.com) in the address bar of windows 7 explorer and press Enter. Step 2 : After pressing Enter, it will prompt for Username, Password. Provide them and click Log On. Step 3 : After you login you can access your FTP just like you access and edit files just like in a regular folder in windows 7 explorer. I liked this method much better than using an FTP client because its so just like accessing regular files and folder in windows explorer. Also copying and transferring files is just like in normal file transfers in windows explorer. I am glad windows 7 has this default FTP support built into explorer. 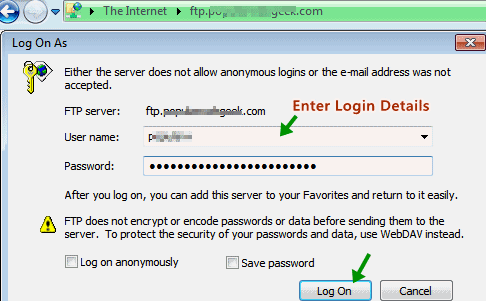 This makes it lot easy to access our FTP account than using a separate instance of a FTP client softwares like Filezilla or CuteFTP. Advantages : If you suddenly need to access your FTP account from a public pc with limited user access, you can’t install any software like a ftp program. But this way you can’t still access your files on your web server in case of an emergency upload, editing etc. Also it makes directly editing certain files easier.